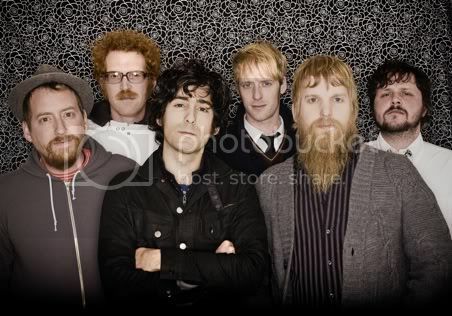 I like Blitzen Trapper. Their last album Furr, which I only heard in late November of 2008, still managed to creep into my Top 10 of '08 List. Their brand of Neil Young-vis-a-vis-Davy Crockett indie rock isn't too hard to grasp, but it's a brand unto their own and they do it well. They just announced a new album, which will drop in June. I'll certainly have it preordered. All that said, I don't really know any of the members by name--I feel like we haven't reached that level in our musical relationship quite yet--so I thought it'd be fun to assign my own names/story to each one. Of course it has to be done in the context of an 1810s frontier tale, but that should go without saying. A band of adventurers takes to the uncharted West, seeking glory for a young nation and themselves. Let's meet em! 1: William O'Shaunessy: An Irish tough, skilled with a rifle, loyal but short-tempered. Something of a loner, he stands guard most nights, rarely sleeps. The others afford him his distance, but wonder of his past. He'll eventually reveal some great personal loss in his past, and it will be evident that his adventures are merely an escape. 2. Dr. Heinreicht D. Gerblehautzen: On sabbatical from the University of Munich where he studies and classifies rare fungi, Gerblehautzen is intrigued by the potential for new and exciting breeds in the New World. His advanced knowledge of plantlife could prove useful to the group as supplies dwindle. 3. Colt Abrams: The group's part-Cherokee leader, he respects nature and fears little. Carries a serrated knife in lieu of a pistol, for he believes firearms to be an "unpure tool". Fluent in several Native American languages. 4. Deidricht Klautz: Understudy and aide of Gerblehautzen. Something of a coward and ultimately a burden; detested by O'Shaunessy. The two will inevitably find themselves separated from the group, forcing them to coexist and learn a lesson about accepting others' strengths and weaknesses. 5. Bobcat Jones: Burly sideman to Abrams, nemesis of Davy Crockett for reasons that remain unclear. He is courageous to a fault, often pushing conflict when diplomacy would suffice. Has a pet wolf named Kodiak. 6. John McGinlock: Wealthy Scottish prospector and distillery owner, funded the expedition in exchange for his inclusion. His motives are strictly financial: He hopes to find new land conducive to opening distilleries in America. His entitlement is an obstacle, and his hatred of the Irishman O'Shaunessy is palpable. I shall heretofore be referring to the members of Blitzen Trapper by the aforementioned names. Looking forward to the new album, and to seeing what kind of adventures they'll have along the way!